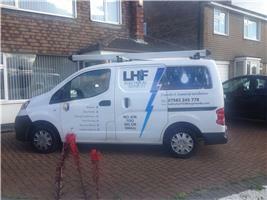 LHF Electrical Services - Electrician based in Mansfield, Nottinghamshire. Hi, my name is Lee Franks and decided to start LHF Electrical Services at the beginning of 2017. I began from leaving school 12 years ago on an apprenticeship scheme lasting nearly 5 years learning the trade on site four days a week and one at college. I sub contract to many companies in the area keeping myself and a chap who works with myself very busy all year round. All domestic works are the most common type we carry out but also do a lot of work for a hotel chain renovating all the rooms, hallways and reception areas. Fully qualified and registered with a governing body to sign off and certificate all electrical work completed.